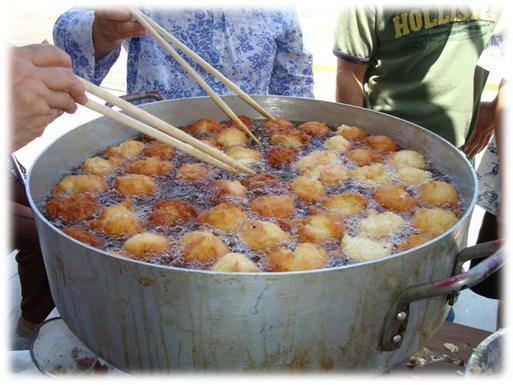 If you are in the Los Angeles area and didn't get enough dango on the Buddhist Church Obon Circuit, stop by the Okinawa Association of America's Annual Bazaar on Sunday! Dude, dangos ARE Okinawan so you know these ROCK! Help support the OAA's only fundraiser while enjoying the sights, sounds and flavors of Okinawan community in Southern CA. There will be an expanded eating section as well as live entertainment, including Okinawan taiko by the Ryukyukoku Matsuri Daiko, uta-sanshin, hula, and a children's game area! Oh I wish I could go. I love all those foods. Hooray! Would you like me to pick up some andagi for you??? If you could post a great recipe for homemade Okinawan dango, I'd love it! Maybe a future post in the making?? Please?? The andagi was our favorite thing to eat there! Liz, Here is my mom's recipe, but there are a lot of different ones floating around.